Tetbury in Bloom - "A force of nature"
At the Annual Town Council meeting in May Tetbury's mayor, Rob McCorkell, described Tetbury in Bloom as "a force of nature". I like that! Despite not competing this year, I hope you will agree that Tetbury in Bloom has continued to maintain the many flowerbeds to our award winning standards. A recent visit to the Lake District revealed that the floral displays of other "in Bloom" entrants were passed their best and yet, when we arrived back in Tetbury on 5th October, our flowerbeds were still full of colour. Our philosophy has always been to ensure that Tetbury looks good all year round - hence our involvement in the Christmas in Tetbury committee! 2012 has been another busy year for us. In April we had a wonderful evening out at Chavenage House in support of the Tetbury Lions Charter evening. We kicked off the season with a Spring Dance on 28th April, arranged by John Newman in aid of both Tetbury Hospital and Tetbury in Bloom. Thank you to: John, Samantha White, "Tony Graham and the Alligators" and the providers of the many raffle prizes for a wonderful evening, described as one of the best ever! In June we took delivery of in excess of 165 hanging baskets and many, many trays of bedding plants to adorn the town. Thank you to Paul Grimes of Wotton Farm Shop for bringing the plants and baskets on and to David Thompson for helping us to erect them. This year I particularly liked the addition of begonias to the flowerbeds and the troughs alongside the Old Brewery Lane car park. Thank you to Les Triggs for donating the begonia plants for The Knapp bed. On Sunday 24th June we held our third annual Open Gardens afternoon. The event was a huge success and we had over one hundred visitors. As always, it could not have been possible without the support of the garden owners who so generously opened their gardens and gave of their time. A special thank you to: Di and Mont Bryan, Brock Bergius (York House), Pam and Ross Dallas, Christine and Barry Gibbs, Frances Lay and Tom O'Brien, Julie and Alan Simcock, Cordy and Trevor Snell, Lise and Chris White and the residents of Helena Court. Not least, thank you to the Women’s Institute for serving the refreshments, Frances Lay for opening up her kitchen for their preparations, Stephen Hirst and Brock Bergius (again) for the cakes, and Tetbury Lions for use of their awning. On 12th August we entered a scarecrow into the Annual Tetbury Show and re-claimed first prize - but we were the only entrants! We had great fun building "Gladly Winnings"; if you are involved in a group or society, you should give it a go next year - it's great fun. Also in August we hosted the Cirencester Civic Society, giving them a tour of the many delightful Tetbury in Bloom floral displays and the key historic buildings in the centre of town. Thank you to Saint Marys' Parish Church for allowing us to finish our tour in the church and enabling us to have somewhere to offer well needed refreshments, the perfect place to end the evening. They couldn't fail to be impressed. In September we held a "Lazy Sunday Afternoon" picnic, which unfortunately had to be held in the Dolphins Hall due to the poor weather. It was a very enjoyable afternoon even though the ambiance wasn't quite the same as sitting on the beautiful lawns of Peter Hervé House! Last month we held our final fundraising event of the year. Thank you to the race night sponsors: French Grey Interiors, Hortensia, Jenny Norden Interiors, Tetbury Hardware, The Pink Cab, The Oxford Wine Company, The Tetbury Tailor and Woodworx Joinery. "Just fantastic" said Mike Kniveton. A great way to end our year. And the list of supporters of Tetbury in Bloom continues to grow, which is wonderful. Thank you to them all, in particular Tetbury Town Council, Tetbury Lions, the Feoffees, and new members Jane Bell and Anne Wakely. We couldn't do it without you all. Tetbury in Bloom put on another wonderful flower display this year despite the untypical weather - a warm March, one of the wettest summers on record and even a mild frost on the last day of August. The summer bedding plants enjoyed all the rain, making for stunning flower displays along London Road and on the Knapp and reducing the watering requirement! The hanging baskets also thrived, making for an amazing display throughout the town centre. Unfortunately the wildflower meadow alongside the ford did not fare so well, with the heavy rains the stream overflowed washing away some of the seed and the remainder struggling to germinate in the cool weather - we will have to rethink our plans there. Whilst the mural remains at the entrance to the vacant Matbro site, we were delighted to be able to present a framed print to Saint Mary's Primary School as a permanent reminder of the hard work and skills of its pupils. A very big thank you to The Art Gallery (Spencer House, Long Street) for framing the print so beautifully on our behalf. I enjoy this time of year, choosing spring bulbs, and it is no different for Tetbury in Bloom. This autumn we will be planting delightful tête-à-tête, a dwarf double-headed and long lasting narcissus, which we will be adding to all the tubs throughout the town. We will be adding 50 kg of daffodils to the bank running alongside the West Street car park -varieties "Bestseller" and "King Alfred", both with large trumpets on tall sturdy stems, together, will flower throughout March. Also we will be adding more crocuses, a good source of nectar for early pollinating insects. Crocus Tommasinianus "Ruby Giant", with its deep violet-purple flowers, and purple "Remembrance" along London Road, the Priory and at the Fire Station. Blushing Apeldoorn - which starts off with yellow petals which slowly turn red! More about our spring floral displays next year. I thought that would grab your attention! I’m referring to this year’s scarecrow entry in the Summer Show. We so enjoyed creating “Gladly Winnings”, Tetbury in Bloom’s homage to the Olympics, the Tour De France and Bradley Wiggins CBE. It all started with the yellow jacket, cycle helmet and knitted sideburns, and we let our imagination flow from there! We had lots of fun building “him”. I am surprised that more organisations or families don’t enter. We also enjoy naming the horses for the Race Night. Tickets are still available for this fund raising event on the evening of Saturday 20th October. They are £5 each and are available from Sue Hirst on 504213. Doors open at 7.00pm and racing starts at 7.30pm; bring along a picnic. Light refreshments and a bar will be available, or bring your own. It’s a good evening’s entertainment. Thank you to the race sponsors: French Grey Interiors, Hortensia, Jenny Norden Interiors, Tetbury Hardware, The Pink Cab, The Oxford Wine Company, The Tetbury Tailor and Woodworx Joinery. The Lazy Sunday Afternoon “picnic” took place in the Dolphins Hall due to waterlogged grass. Listening to the beautiful voices of “The Tender Trap” singers was a delightful way to pass a Sunday afternoon with friends. Have you explored Saint Marys’ churchyard recently? If not, do take a few minutes to see what the team has done. (It was a particular hit when we took the Cirencester Civic Society on a tour back in August.) The wedding cake tree, planted last year by HRH the Duchess of Cornwall, is doing well. In addition to the formal flowerbeds, we have introduced a fernery (a specialised space for the cultivation and display of ferns and other shade loving plants). This now fills a dull dank corner at the back of the church and the ferns just love it!. Next to the fernery is the bed we created around the burial places of former vicar of St Marys’, Canon Michael Sherwood, and a former church warden, Derek Bowsher. This bed is mainly planted with different coloured heucheras, a favourite plant of ours, which is used throughout the town in lots of the planting schemes. Another area that has developed well, and has its own unique informal style, is the bed by the electricity substation, situated almost opposite the front doors. Unfortunately, due to the fertility of the soil, our plan to create a wildflower “meadow” has not been success but we have left some wildflowers in amongst the grave stones, which are doing well. It is a real haven in the heart of the town. Next month we will be planting many hundreds of bulbs in and round the town to keep our spring displays “topped up”. We also have plans to re-work the Royal Anniversary Gardens and the Diana flowerbed – more about that in another article. It was good to hear from a neighbour that the town's flowerbeds were a source of joy during the poor summer months; the hanging baskets and bedding plants, in particular, thrived in the damp weather and contributed to a beautiful display. Anniversary Gardens was one of the floral displays we visited on 13th August, when we welcomed members of the Cirencester Civic Society to Tetbury to provide them with a guided tour of our historic town centre. Thank you to the Reverend Canon John Wright for letting us use Saint Marys church for refreshments at the end of the tour. On 12th August we participated in the Summer Flower Show by entering the scarecrow competition. Our scarecrow building evening has become a feature in our annual calendar and is a source of great amusement as we seek to come up with something different each year. Do remember our musical afternoon on the lawn at Peter Hervé House from 3.00pm to 5.00pm on Sunday 2nd September. Bring along your own picnic, refreshments, chairs or rug and relax and enjoy the entertainment courtesy of The Tender Trap trio - three ladies with fabulous voices singing in three-part harmony, accompanied by key board and drums. They give a totally unique interpretation of classic popular songs from the 1940's through to the 1970's. Tickets cost £2.50 for adults (children are free) and are available from Sue Hirst on 504213 or at sue@teburyinbloom.org.uk. We look forward to seeing you. Tickets are also now on sale for the Horse Racing fund raising event on Saturday 20th October. Tickets costs £5 each and are available from Sue Hirst on 504213. It has proved a highly enjoyable and popular evening in the past. Finally, thank you also to IHS for their generous donation towards our works. Without your on-going support we could not do what we do. Tetbury in Bloom is not competing this year but we are still committed to maintaining the many floral displays to our award-winning standard. We are in the process of remodelling the Knapp. One of the choisya did not survive the last two harsh winters, meaning that its partner has had to be removed to preserve the symmetry of this flowerbed. This will provide the other large shrubs, the two physocarpus and central berberis, more room to grow. Any remaining gaps will be filled with our favourite long-flowering perennial, penstemons. In previous years we have used geraniums in reds, pinks, oranges and magenta as summer bedding. This year the Council grounds foreman has plans to plant the Knapp with large flowering begonia – I look forward to seeing the results. The Knapp was the first flowerbed to receive a Tetbury in Bloom makeover in 2006. (Perhaps we should erect a plaque!) It was following our success at the Knapp that we adopted the sustainable mixed planting for which we have been renowned, using shrubs and perennials with colourful foliage to provide all year round interest in reds, yellows, pinks and oranges. To create the look plant Choisya Ternata, euonymus, heuchera, spiraea “Gold Flame”, physocarpus and berberis, together with phlox, hardy fuchsias and penstemon. It was a delight to see the local residents holding their Jubilee street party on the Knapp, enjoying this delightful space. At the time of writing we are preparing for the third annual Open Garden’s weekend (and hoping that the weather will improve); , when you read this article, however, it will be over for another year. Thank you to everyone who agreed to open their marvellous gardens to the public: Di and Mont Bryan, Brock Bergius (York House Bed and Breakfast), Pam and Ross Dallas, Christine and Barry Gibbs, Frances Lay and Tom O’Brien, Julie and Alan Simcock, Cordy and Trevor Snell, Lise and Chris White (Hookshouse Pottery) and the residents of Helena Court. It is crazy really, here we are in the middle of summer with the flowerbeds and hanging baskets looking their best and yet we are also planning for the Christmas lighting displays, in association with Christmas in Tetbury! More about our plans in my next article. Sunday 2nd September - The “Lazy Sunday Afternoon” jazz concert in the beautiful gardens of Peter Hervé House. Just bring along a picnic and enjoy the music. Tickets cost £2.50 per person to cover the cost of the band; entrance for children is free. To purchase your tickets, please contact Sue Hirst on 504213. Friday 14th September - Jazz evening and meal at the Close Hotel. Tickets cost £25 per person – this includes the food and the music. For timings and tickets, please contact Sue Hirst on 504213. It should be a wonderful summer – let’s hope that the weather doesn’t let us down. With the threat of frosts gone, June is a great time to plant annuals, perennials and shrubs – the threat of a hosepipe ban permitting of course!. On Tuesday and Thursdays (mornings and evenings), therefore, from 7th June the whole team will be out planting the summer bedding displays in preparation for another stunning display. 21 Northfield Road (GL8 8HD) – this long garden is full of interest and wonderfully laid out. Mature and unusual trees and shrubs take your eye, and draw your feet, to the far end, and then you find a hidden productive plot! Hookshouse Pottery, Hookshouse Lane (GL8 8TZ) – extensive gardens with water garden, treatment pond and woodland glade; a beautiful garden and participant in the National Garden Scheme. Tickets cost £5 per person; this provides entry to all nine gardens. (There is no entrance fee for children.) Refreshments will be available at The Stables. All funds raised will go towards “in Bloom” projects. For advance tickets, contact Ange Morrissey on 505723, alternatively buy your ticket at the first garden you come to where you will receive details of all the gardens. We look forward to seeing you. It was a great event last year with an estimated 150 visitors exploring the town. Thank you to the Chamber of Commerce for their generous donation towards our work. Also, the organisers of the Spring Dance (in aid of Tetbury Hospital and Tetbury in Bloom) would like to thank Samantha White, and the generous people and traders of Tetbury, who kindly donated raffle prizes: Bath Bridge Barber Shop, Cafe 53, Cherish Beauty Salon, Close hotel, Creative hairdressing, Gatcombe Park, Hortensia, Jesse Smith Butchers, Lloyds Bank, Long Street Antiques, Martin White Jewellers, Moloh, Mr & Mrs S Hirst, Oxford Wine Company, Perfection Beauty, Perry Bishop, Pyot @ Cafe 53, Priory gym, Quayles, Scentiments, Snooty Fox Hotel, Tetbury Copy Shop, Tetbury Fish & Chip Shop, Tetbury Hospital, Tetbury in Bloom, Tetbury Tailor, The Two Toads, Thomas Panton, Westonbirt Arboretum and Whately Manor. Finally, if you have ordered a summer hanging basket from us, please note that we will be delivering them on Tuesday 12th June, not Thursday 7th June as originally planned. We apologise for any inconvenience caused. For many years my Mum and I have visited the Malvern Spring Garden Show – my favourite of all the RHS flower shows. We particularly enjoy the exquisite displays in the floral marquee and the opportunity to buy plants from some of the country’s best plantsmen, set against the magnificent backdrop of the Malvern Hills. It never fails to impress me how, in just a few weeks, designers, such as Chris Beardshaw, can turn an empty space into an inspirational garden that looks as though it has been there for years. On the other hand, isn’t that just what Sue and the Tetbury in Bloom team have done throughout Tetbury? When I look back just a few years it is hugely impressive what has been achieved with the roundabout at the Cirencester entrance to the town. (It is, perhaps, our most stunning display and, definitely the most commented upon.) Before 2006 it was simply a bare space with a tree surrounded by lavender bushes at its centre, a few small box trees framing three, rectangular, seasonal flowerbeds and some very large chevron signs around the edge. Now it is a delightful “garden”, with something impressive to see at any time of year and from all angles! In May, the alliums are coming through to replace the tulips and other spring bulbs, with the promise of more delights to come. To create the look, plant long flowering perennials such as penstemons, fuchsias, cranesbill and osteospermum, together with colourful foliage shrubs such as spiraea “Goldflame” and berberis thunbergii, “atropurpurea”. A “walk and talk” is planned for members of the Cirencester Civic Society on Monday 13th August. If you would like us to talk to your group or society, please contact Sue Hirst on 504213 to discuss the arrangements. On September 2nd we are planning “A Lazy Sunday Afternoon” in the beautiful gardens of Peter Hervé House. Just bring along a picnic and we will arrange for music by “The Tender Trap” trio, by way of entertainment. Tickets cost £2.50 per person to cover the cost of the band; entrance for children is free. On 20th October we will be holding another race night fund raising event with compare, Brian Cooke. This event proved so successful last year that we have already sold tickets! I will, of course, provide you with the full details nearer the time. And thank you to Paul Newman, the Feoffees, Tetbury Upton Parish Council, the Woolsack Committee and Perry Bishop and Chamber estate agents for their generous donations. I particularly love this time of year. Longer, warmer days should be with us in April and the stronger sunshine means that the garden is bursting into flower. Tulips provide a wonderful splash of colour in the spring, after the long dark days of winter, and they should be at their best from early April. Tulips are amongst the most popular of flowers of all time and are, apparently, the third favourite after roses and chrysanthemum. In the early 17th Century, in the Netherlands, a tulip craze struck and the price of tulip bulbs soared to astronomical prices - at the height of the mania, a single bulb sold for the equivalent of $150,000 (perhaps more depending upon which historical record you believe). Things were getting so bizarre that people were selling everything they owned for the privilege of owning tulips! Fortunately, today, tulips are more affordable and readily available. We leave the tulip bulbs in the ground, supplementing numbers every other year. They couldn’t be easier to care for; the only thing you need to do is to cut off the dead and dying foliage after it has died down. We plant summer bedding on top, taking care not to damage the bulbs and immediately replant any that work their way to the surface. At the time of writing there were tickets remaining for the Spring Fund Raising Dance - tickets cost £5 per person and can be obtained from John Newman at Jesse Smiths Butchers, Long Street; from the hospital reception and from Sue Hirst on 504213. The band “Tony Graham and the Alligators” will be playing live and burgers will be available. A grand raffle draw will be held on the night with fantastic prizes donated by many of the businesses in the town. We look forward to a great night and to seeing you there. Also, there are still some hanging baskets for sale – the baskets contain three stunning varieties of trailing begonias and cost £30 each. To place an order, call Sue Hirst on 504213, or email her at slee@tecres.net. The baskets will be delivered in early June. Finally, thank you to the Lions Club of Tetbury for their generous donation to help us to continue our work. As I write this article signs of spring are all around us. In order to provide an even bigger and better display Tetbury in Bloom planted a further 3,200 spring bulbs last autumn. We planted over 500 “Unsurpassable” daffodil bulbs alone on the bank at the back of the West Street car park, among the native birch trees. This variety is fragrant and attractive to bees and butterflies; it should naturalise and spread, thereby creating a beautiful display every spring for many years to come, brightening up a dull “corner” of the town and representing a good long-term investment! For the best spring display I recommend that you take a stroll around Saint Marys’ churchyard. Over the past three years we have planted cyclamen and snowdrops in the semi-shade of the plum trees, creating a tapestry of pinks and whites, inspired by nearby Colesbourne Park Gardens. From March primroses will emerge from between the gravestones. Whilst more traditionally associated with woodlands, it was a Victorian custom to plant primroses on the graves of small children which, perhaps, explains their presence. English bluebells will appear from April through to May when the weather begins to warm up. Commonly found in deciduous woodland, they will naturalise in the grass over time. As well as looking beautiful, such spring flowers provide essential early nectar sources for bees, butterflies, hoverflies and moths. Nest boxes and insect houses also help to provide a rich habitat for wildlife. Looking further ahead, we are now taking orders for our summer hanging baskets. Following on from last year’s success, and the many complements we received, they will contain trailing begonias. Their waxy, eye catching flowers will bloom in glorious masses during summer and, with regular watering and feeding, they should flower well into the autumn. This year we will be using begonia varieties “Illuminations, “Superstars” and the stunning “Firewings” in shades of scarlet, apricot, pink and lemon. The task of watering will be made easier because we have invested in plastic easy-watering baskets and the need for deadheading is reduced because the large flowers simply drop off. Hanging baskets cost £30 each. They will be available at the beginning of June and delivered to your door; it couldn’t be easier. To reserve your hanging basket, call Sue Hirst on 504213, or email her at slee@tecres.net. Remember, all profits go towards funding Tetbury in Bloom initiatives. John Newman will be holding a Spring Dance by way of a fund raising event on Saturday 28th April; the profits will be split between Tetbury Hospital and Tetbury in Bloom. Thank you John. Tickets cost £5 per person and are now available from John Newman of Jesse Smith Butchers, Long Street and from Sue Hirst on 504213. We are seeking people who would be interested in opening their garden to the public on the afternoon of Sunday 24th June, to “replace” those that have kindly already opened for two years. If this appeals to you, please contact Ange Morrissey on 505723 – she will be delighted to hear from you. Finally, Tetbury in Bloom will be taking part in the Dolphins Hall Expo on Saturday 31st March, to support the launch of the fund raising appeal and plans for an improved community hall – we look forward to seeing you there. Tetbury in Bloom ended 2011 on a high. HRH the Duchess of Cornwall has kindly agreed to be patron of Tetbury in Bloom. This is a huge honour and a great testament to the hard work of so many. As the Cotswolds prepares for a surge in tourists in 2012 due to the Olympics and Her Majesty The Queen’s Diamond Jubilee, Tetbury in Bloom will do its part in helping to ensure that the town looks its best for residents and visitors alike, by maintaining its high standards and attractive, and imaginative, floral displays. Members of the Tetbury in Bloom team are out and about every week – even at this time of year. Back in November they also helped out by putting the lights on over fifty Christmas trees in the town centre; in December they acted as marshals for the torch-lit procession and in January they helped with taking the Christmas trees down. What a dedicated, hardy, bunch they are – for which we are extremely grateful. If you are seeking a new exercise regime, or a worthwhile cause to join, please contact Sue Hirst on 504213 – the more the merrier. Once the plot is weed and grass free, you are ready to sow in the bare soil. Good luck. As we begin a new year our thoughts turn to plans for another season including: new planting schemes with less reliance on summer bedding; suitable locations to introduce more wildflowers to the town; hanging baskets and the epic task of watering them and new fund raising ideas. 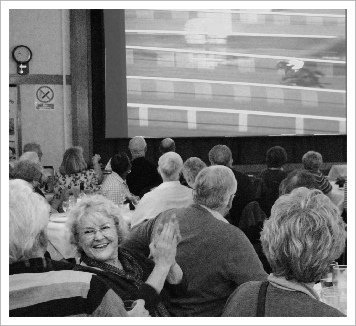 Our autumn fund raising event, “A Hot Night at the Dogs” race night on 19th November was another great success and a fun evening was had by all. Thank you to everyone who attended, to Colin Poole and Paul Stead for cooking the food and to our sponsors: John Newman, The Ark Angel, The Close Hotel, The Tetbury Art Gallery, Grosvenor House Practice, Haine and Smith opticians, Anne Fowler antiques, Sentiments florists, and the George Veterinary Group. Fund raising is important to Tetbury in Bloom. We are a not-for-profit organisation and all money we raise goes towards “in Bloom” projects which, last year, included more spring bulbs, summer bedding, box trees, wildflower seed, shrubs, tubs, troughs, sundries, signage and over 60 bags of compost! Gardening is not necessarily a cheap hobby, but it is a worthwhile one, as I hope you will agree.